Version 0.5.0 of Kiln is now available! There are several improvements in this release, but there is one we’re most excited about: baking. You can now use Kiln, along with a Ledger Nano S, to stake on the Tezos blockchain. At this time, Kiln must be built from source to take advantage of this feature. However, work is already underway to package Kiln in distributions which are easy to use. We’ll begin releasing these distributions in the coming weeks! In the meantime, we’d like to put a call out for beta testers who would like to start baking in Kiln. If you are interested and not already a member of our Slack group, join by sending an email to tezos@obsidian.systems! We’d love to hear from you. Conveniently, Tezos’ amendment process will undergo one final test on zeronet beginning next week. This is a great opportunity for bakers to participate in this test while providing us with invaluable feedback. Kiln is the only baking solution that manages all the elements necessary to bake locally through a UI. 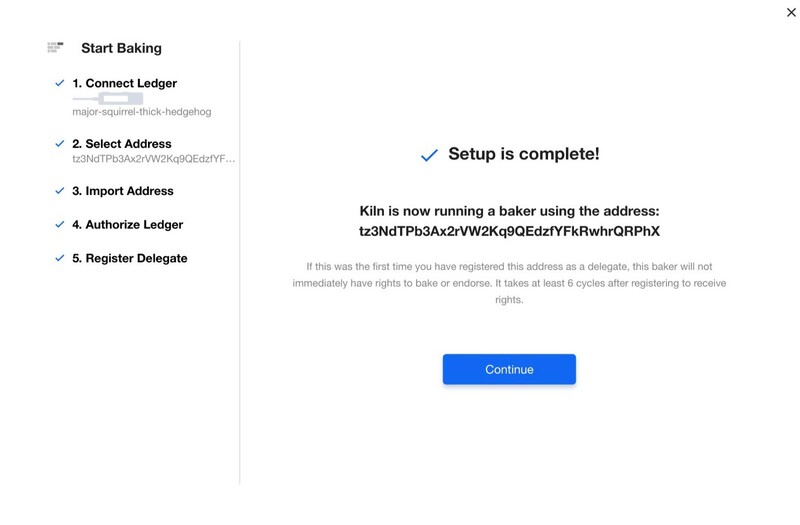 It runs a full node, the baker, the endorser, tezos-client, and manages communication with your Ledger Nano S.
Here’s how it works: once Kiln’s node is synced with the blockchain, click Add Baker to open a modal with the option to Start Baking. Kiln will then guide you through the setup process. It first detects when you’ve plugged in your Ledger Nano S and opened the Tezos Baking application. Kiln then starts checking commonly used addresses on your ledger, such as the ones wallet providers use. Don’t see yours? No problem — you can search for any address on the device. 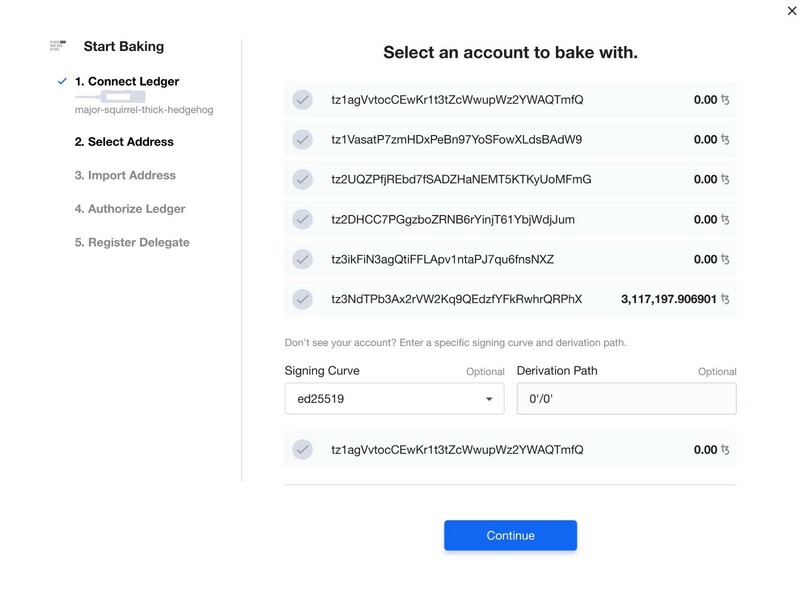 After you’ve selected the address you’d like to bake with, simply respond to prompts on the Ledger device for importing it, authorizing baking, and registering as a delegate on the blockchain. Already baking? Great! Switching to Kiln is easy. Just follow the same setup process. When it comes time to register as a delegate, Kiln will detect that you are already a baker and get you started right away. Just be sure to shut down the baker and endorser you were previously using!! Once you’ve completed this initial setup process, Kiln will automatically monitor your node, baker, and endorser and notify you of any issues. While we always advise that you stay in tune with your baker and the Tezos network, this is as ‘set it and forget it’ as baking gets! This release has several new features that will benefit all users, too! Telegram notifications can now be sent to groups — you asked, we listened! Smarter Public Node updates — the data we show is more accurate and up-to-date than ever. We’ve fixed a few other bugs, too. Most notably the ‘Node is on a branch’ bug we introduced in our last release (v.0.4.1) which showed up when using the Obsidian Public Node on chains longer than 100k blocks has been fixed. As mentioned above, we’re making Kiln more accessible by packaging it for various environments. We’ll first release a Linux (Debian) distribution and a package that can be run in a VM on any operating system. This release is a turning point for Kiln. We’re thankful for the support the Tezos Foundation, TQ Group, and the entire baking community has provided us over the past year of building on Tezos. We appreciate the opportunity to make baking more secure and more accessible. In Kiln alone, we’ve made over 1,500 commits, 400 merge requests, and poured thousands of hours into making this a premier baking product. If you’re not satisfied, please let us know. We’re here to answer any and all of your questions in our Slack Group — just email tezos@obsidian.systems for an invite!